When your teeth are stained or discolored, the last thing you want to do is smile. But at Lakebrink Dental, we can fix that with teeth whitening. We offer different ways to whiten, making it easier for you to have a brighter smile. We provide several bleaching treatments for your every need. Dr. Lakebrink and Dr. Mitts offer everything from whitening strips, to professional chairside whitening with Zoom! or Sapphire, along with take-home, professional-grade whitening kits designed specifically for you. Zoom! in-office whitening dramatically brightens your smile by 6-10 shades whiter in one short visit. If you are looking for immediate results Zoom! is for you. The Zoom! treatment is simple and convenient. Zoom! gently penetrates your tooth surface using a special light and gel removing stain and discoloration, leaving behind a bright, dazzling smile you can be proud to show off. removing stain and discoloration, leaving behind a bright, dazzling smile you can be proud to show off.Take advantage of the #1 light activated whitening system, call our office at 816.792.4455 to schedule an appointment. Are you looking for instant results but have sensitive teeth? No need to worry, we have the thing just for you! Lakebrink Dental offers a variety of bleaching products for you including Sapphire which was developed to gently whitening with little to no sensitivity. Call to schedule your appointment with Dr. Lakebrink or Dr. D. Alexander Mitts at 816.792.4455. Some patients prefer to whiten at home, and Lakebrink Dental can accommodate this desire. Professional whitening performed at home with a kit you’ve received at your dentist’s office is more efficient and effective to the treatments you might find at a drug store. 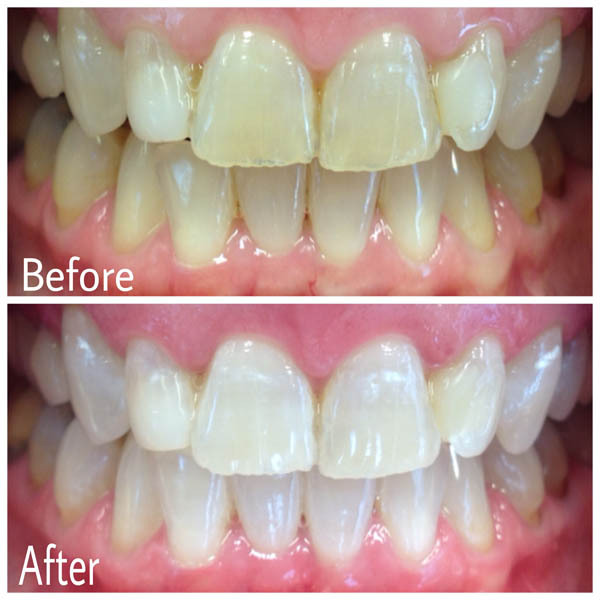 Lakebrink Dental makes custom bleaching trays created by using molds of your mouth. The trays fit the contours of your teeth for superior whitening results while ensuring the perfect fit and even coverage throughout.